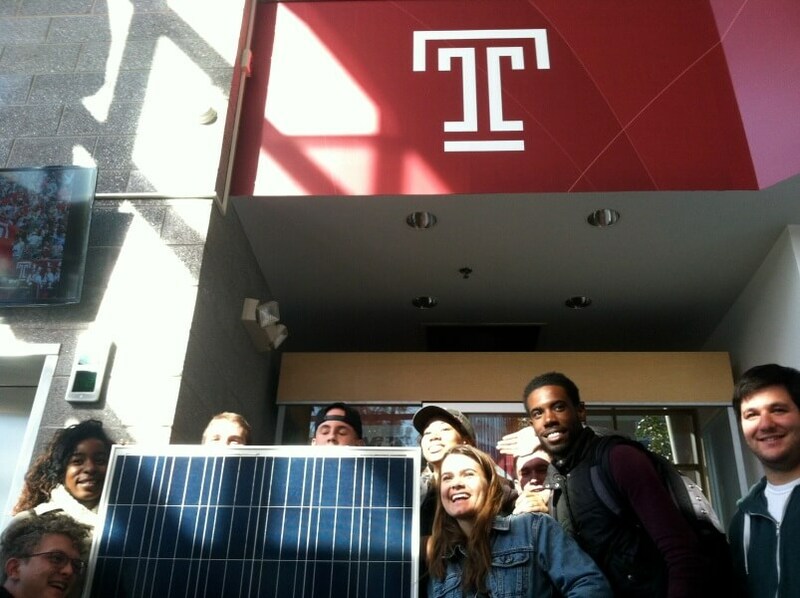 Temple students celebrate sustainability on campus with a solar panel from the project inside Edberg-Olson Hall. Radnor, PA, October 31, 2013 – Community Energy, the original green electricity choice for PECO electric customers, kicked off construction of its latest solar project at Temple University’s Main Campus in North Philadelphia last week. The construction start drew about one hundred students with enthusiasm for Community Energy’s mission—to build more solar generation as more electric customers sign up. Last year Community Energy built the largest solar project in Pennsylvania with support of commercial customers like the Philadelphia Phillies and area universities. The construction kickoff for this latest solar project started last week with Temple’s Green Council student groups celebrating the live on-campus step toward sustainability and discussing long-term sustainability goals for the university. Tens of thousands of SEPTA commuters will see the Community Energy Solar project at Temple University from the trains as they pass Edberg-Olson Hall on their way out of Center City Philadelphia. On the south facing roof of the Temple athletic facility, the approximately 4,500-square-foot solar array will consist of 268 solar modules producing 63-kilowatts of photovoltaic (solar) power.